Sea Grant supports cutting-edge research in the areas of coastal processes, hazards, energy sources, climate change, stormwater management and tourism. Communities seek Sea Grant expertise to support and sustain diverse and vibrant economies in the face of changing environmental conditions, including rising sea levels. 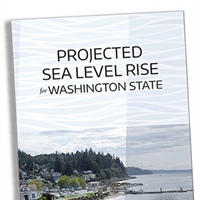 A new report led by Washington Sea Grant and the University of Washington's Climate Impacts Group provides the clearest picture yet of what Washington state can expect from rising sea levels. The report includes projections for over 150 different sites along the state’s coastline and provides estimates that will allow planners to weigh the risks of different scenarios. The new report is part of the Washington Coastal Resilience Project, a three-year effort funded in 2016 by the National Oceanic and Atmospheric Administration (NOAA). Overall, the report gives a statewide estimate for about 1.5 feet of sea-level rise by 2100 if future greenhouse emissions are limited. The projections also include an embedded map where those involved with planning projects along the coast can download estimates for their specific location. In July 2018, the Mayor of Honolulu issued a directive requiring all city departments and agencies under the mayor’s jurisdiction to take several actions, including using the Sea Level Rise Guidance and Hawai‘i Sea Level Rise Vulnerability and Adaptation Report, which was developed with Sea Grant guidance and technical support as well as with supplemental funding secured in 2016 by Hawai'i Sea Grant from NOAA’s Coastal Resilience Grant Program, in their planning, programing and capital improvement decisions to mitigate impacts to infrastructure and critical facilities subject to sea level rise, which may include elevation or relocation of infrastructure and critical facilities, the elevating of surfaces, structures, and utilities, and/or other adaptation measures. Based on the same work by Sea Grant and partners, the County of Maui passed a similar directive earlier this year. Learn more about Hawai‘i Sea Grant’s sea-level rise work. Low-lying communities in coastal Georgia like Tybee Island and St. Marys are experiencing increased vulnerability to flooding events and sea-level rise. In 2016, Georgia Sea Grant collaborated with Tybee Island to develop an award-winning Sea-Level Adaptation Plan. Extension professionals partnered with researchers to canvass a variety of stakeholders, generate cost-benefit analyses, model the impacts of king tides, and facilitate public information meetings. As a result of Sea Grant’s efforts, Tybee Island achieved CRS (Community Rating System) rating of 5, enabling savings of $725,639 annually in flood insurance premiums for property owners. Inspired by the success of Tybee Island Sea-Level Rise Initiative, St. Marys collaborated with Sea Grant to implement a new Flood Damage Prevention Ordinance, and in 2017 entered the CRS at a level of 7, resulting in citywide savings of $87,740 annually in flood insurance premiums. To date, Sea Grant has helped 16 coastal counties and cities in Georgia to become active participants in the CRS. USC Sea Grant has developed a robust stakeholder engagement process to help Southern California communities plan for the impacts of climate change along urbanized coastlines. Since beginning this work in 2010, the program’s reputation as a source for non-biased scientific information and long-established relationships working across science, policy, and cultural boundaries put Sea Grant in a unique position within the region to build capacity across jurisdictions. 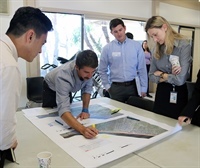 The Regional AdaptLA: Coastal Impacts Planning in the Los Angeles Region program strives to provide this link to local coastal jurisdictions and to develop a community of practice for the region. It is a multi-year project, funded by the State, among a coalition of 11 local municipalities, Los Angeles County and six supporting organizations. USC Sea Grant provides leadership for the program, as well as technical assistance, training workshops and webinars. AdaptLA engages cities from Long Beach to Malibu, increasing collaboration among coalition partners, and increasing use of the best available science in planning efforts. As a result, many cities are making significant progress in integrating climate change considerations into their existing planning mechanism and evaluating potential strategies for adaptation along the coast. Read more about USC Sea Grant’s Sea Rise Vulnerability Study for the City of Los Angeles. In Hampton Roads, a region of coastal Virginia with the highest rate of sea level rise on the Atlantic Coast, local governments must adapt their communities to increasingly more severe and frequent flooding. 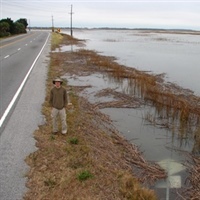 Wetlands Watch, a non-profit working to protect wetlands and adapt to sea level rise, was awarded a four-year grant to explore sea level rise solutions with Virginia’s colleges and universities, including Virginia Sea Grant, through a new initiative called the Resilience Research and Design Collaborative Laboratory. The initiative is modeled after the Sea Grant-funded Chesterfield Heights project, which paired engineering and architecture students and faculty to develop nature-based sea level rise adaptation designs for Chesterfield Heights, a historic neighborhood in Norfolk, Virginia burdened by recurrent flooding. Components from the designs will be implemented in Chesterfield Heights through a $120 million grant from the Department of Housing and Urban Development.